Research shows that Helicobacter pylori (H. pylori) is suppressed by Haritaki, Terminalia chebula. Research into the effects of Haritaki, ( Terminalia chebula, or Kadukkai) shows that it is effective in reducing the potency of the bacteria H. pylori. Helicobacter pylori (H. pylori) is a bacteria that causes havoc in the intestinal tract. If this bacteria resides there for some years the irritation is causes can create major health issues. Stomach ulcers can be caused, and the more extreme conditions include stomach cancer. The medical community recommends that antibiotics are used to eliminate the H.pylori, but for some people these do not provide a solution, and for others they do not want to take antibiotics too frequently. 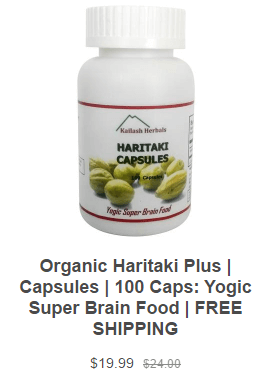 In this case, Haritaki is one herbal solution that research has been shown to work. In my own research I found that haritaki was more effective at wiping out e-coli than bleach. This test was conducted in petri dishes, not in the much more complex situation that haritaki finds itself in when landing in your stomach and intestinal tract. There is additional information on the effects of Haritaki on e-coli and we will publish that soon. Research also indicates that haritaki is helpful with other digestive system diseases including Crohn’s disease. Commonly called haritaki in Ayurvedic Medicine, this herb is from a tree that grows in India. The plant is used extensively in the preparation of many ayurvedic formulations for a variety of health concerns including chronic ulcers, fungal skin infections, digestive problems, constipation, heart disease, tumors, nervous disorders, asthma, and more. The H. pylori bacterium has been estimated to be present in 30-40% of the U.S. population, and is considered the world’s most common chronic infection. Are you at risk for developing an ulcer? Approximately 25 million Americans suffer from peptic ulcer disease (PUD) at some point in their life. And each year there are 500,000 to 850,000 new cases reported, and more than one million ulcer-related hospitalizations.1 Continue reading to find out if you are at risk … and what you can do to protect yourself—or heal yourself, if you already have an ulcer. Not too long ago, the common belief was that excessive work and chronic stress caused stomach ulcers. Although it is true that stress can exacerbate an ulcer, we now know that H. pylori, a spiral-shaped bacterium, is the cause of more than 90% of duodenal ulcers and up to 80% of gastric ulcers.